Paul White, known to most as Lord Hanningfield and leader of Essex County Council, is to face six criminal charges under Section 17 of the Theft Act 1968 (Section 17 is the part of the Act that relates to “false accounting”). He, along with three Labour MPs (Elliot Morely MP, David Chaytor MP and Jim Devine MP), have been summonsed to appear at the City of Westminster Magistrates’ Court at 2pm on 11 March 2010. The maximum sentence that could be applied under Section 17 is seven years’ imprisonment. As these cases have been investigated by the police, the authority responsible for prosecuting is the Crown Prosecution Service (CPS). Interestingly, although defence lawyers for those charged have raised the issue of Parliamentary privilege, the Director of Public Prosecutions Keir Starmer QC is clear in his statement that “the applicability and extent of any Parliamentary privilege claimed should be tested in court”. Parliamentary privilege is an ancient privilege granted to parliamentarians, however the extent of its protection is both widely misunderstood and fiercely contested. When the Speaker made a statement to the House of Commons on 3 December 2008, regarding the arrest of Damian Green MP and entry into his offices, he reminded Members of Parliament that, according to Erskine May (Parliament’s authoritative companion guide to procedure), parliamentary privilege has never prevented the operation of the criminal law. He also restated the position of the Joint Committee on Parliamentary Privilege in its 1999 report that “the precincts of the House are not and should not be ‘a haven from the law’”. According to the BBC, Lord Hanningfield has resigned his front bench position as Conservative business spokesman and stood down as leader of Essex County Council. David Cameron also requested that Lord Strathclyde, the leader of the Conservative opposition in the Lords, suspend the Conservative whip with immediate effect. The sheer arrogance of Lord Hanningfield is unbelievable. The leader of Essex County Council clearly thinks he is running his own version of Essex Bank, rather than leading an elected local authority. The latest venture from the Bank of Essex – surely the greatest testament to personal ego of any initiative in local government in recent years – is to offer a £100,000 overdraft facility to eligible businesses. Admitting you are no longer capable of running public services and handing them wholesale to IBM is one thing, but doing so as you extend the commercial operations of a bank that only exists because of your elected mandate is something entirely different. At no point do I recall my local successful candidate at the County Council Election, Cllr John Schofield, informing voters that he intended to be a party to such speculation with public funds: public funds provided by hard-working Council Tax payers. According to the Frequently Asked Questions on the Banking on Essex website, all profits from the venture will be used to cover potential losses and protect taxpayers’ funds. Where has Lord Hanningfield been for the last eighteen months? “Will the initiative put tax payers’ money at risk? Essex is the Education Authority. Essex is also attempting to generate a sense of commercial confidence. The example above demonstrates why politicians should put their determination to write themselves into history to one side and stick to what they were elected to do: represent the interests of the people who put them in office. These two pictures were taken of the main footpath to the principal site of Basildon and Thurrock University Hospitals on Christmas Eve 2009 – exactly one week after the heavy snow falls that caused chaos in South Essex. It was still iced over even when the snow on surrounding banks had melted and the roads had been gritted. “[We] primarily serve the almost 400,000 population of Basildon and Thurrock in South West Essex, plus some residents of the neighbouring districts of Brentwood (for whom we are the main provider of cardiology services) and Castle Point. And pictured just above is the path people had to walk to reach that hospital, should they not be fortunate enough to drive a car. I met an elderly constituent of mine as I walked to town that Thursday. He was incandescent. He is usually a charming conversationalist, but that day he had only three words for me as he gestured unsteadily with his walking stick at the ice: “It is wicked”. So if there was no shortage, I can only assume that Essex County Council simply doesn’t care about pedestrian access to the major health facility in the south of the county. 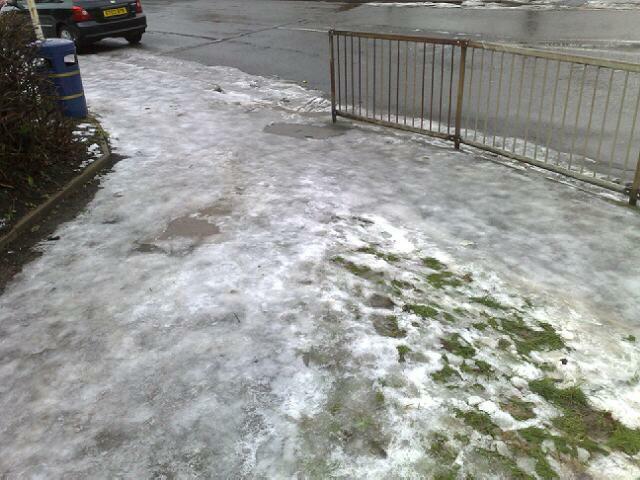 Surely, if there was salt, and it gave a stuff, Essex would have taken the time to grit this major pedestrian route? Winter 2008/2009 saw the highest excess winter mortality rates for ten years. It is hard to believe that figure will be lower for 2009/2010 if this Winter is harsher. Respiratory illnesses are just one set of conditions that are exacerbated by conditions in the winter months. (If you are really interested, there is a superb paper on the website of of the Centre for Public Health at the Liverpool John Moores University entitled Weather forecasting as a Public Health Tool). People need to be able to get to hospital – and that includes by foot. “There is a moderate risk of severe weather affecting east and southeast England. Outbreaks of sleet and snow will become heavier during Tuesday afternoon and evening, with an increasing risk of disruption to transport networks. Sky News is warning Heavy Snow Set to Bring More Travel Chaos. 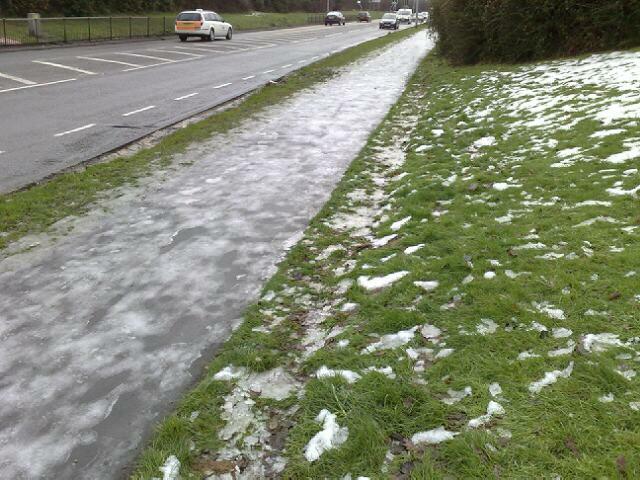 The question I have is: will Essex County Council heed the warnings and make an effort to ensure that key footpaths are snow and ice free this time around? Stop throwing the taxes of hard-working local people at self-indulgent, speculative schemes. Stop criticising the press for reflecting local concerns. Start delivering a basic level of service: grit our roads and footpaths, especially where they provide access to major facilities such as hospitals. “Labour’s IT procurement process has been marked by a catalogue of failures, late deliveries and cost overruns. You can read the full story in the Telegraph by following this link. A week is clearly a long time in Tory politics. On December 22 I blogged about the £5bn proposal by Lord Hanningfield‘s Tory administration in Essex to hand over the running of services it is unable to provide effectively itself to IBM. You can remind yourself of the story here. Contrast the Tories’ willingness to talk tough on cash limits on IT projects at the centre (probably quite sensible knowing how badly some of them have failed), with their example in local government in Essex. Unlike other local authorities, Essex are off-loading services that they clearly believe they are no longer capable of delivering. It strikes me as a comprehensive admission of political failure to deliver. If Maude’s boast is to have any credibility, the sheer untested lunacy of Hanningfield’s project demands robust intervention from Cameron et al. Just as irresponsible spending on projects in Whitehall needs clamping down on, so local authorities, including Tory Essex, should not receive carte blanche to experiment with innovative IT projects at vast public expense. Headline-grabbing opportunism is one thing. Dealing with your own IT cowboys is something entirely different. This is a deal that has the potential to fundamentally alter the nature of local government in England. A Cameron win in 2010 could see a revolution in the provision of local services that strangles political differentiation, subjugates community priorities to an ideology of technocratic efficiency – and all whilst reassuring voters that these changes are merely efficient and (of course) apolitical. Superficially, the attraction is obvious. Politicians are held in contempt on a national and local level. (Ironically, Lord Hanningfield bridges the gap between the national expenses scandal and the crisis in local service provision in extraordinary fashion, with reports that detectives have sent files to the Crown Prosecution Service alleging fraud, just at the point that Essex County Council, which he leads, is condemned for its appalling record on children’s services.) What better way to score a political victory than to tacitly acknowledge that distrust by placing the delivery of services in the hands of a non-political and widely-respected industry leader such as IBM? I have no ideological objection to the delivery of public services through the private sector. I believe that the well-considered and appropriate out-sourcing of services and the importation of industry best practice have led to genuine improvements in service. The key to its success is the accountability that comes from having contracts that are carefully scrutinised, regularly reviewed and competitively tendered for. At the same time, I am very conscious that public services are exactly that: services provided to the public by authorities that should be transparent, prepared for detailed scrutiny and, ultimately, held to account. There is a balance to be struck and the job of local politicians is to strike that balance, serving the needs of those they represent as best they can. Those in opposition draw attention to deficiencies in current services and offer an alternative programme for local priorities. Ultimately, the people who pay for and use those services decide who they want in charge. Hanningfield’s wheeling and dealing should send a chill through anyone who still places a value on choice, transparency, accountability, competition and social justice. Companies like IBM don’t invest in technological infrastructure to run services for a couple of years. They expect to be the partner of choice for many. The contract we are told is for eight – well beyond the date of the next County Council elections. And as many will have noticed, it is measurably harder to extract detailed information from private sector partners, council officers nervously explaining that such information is restricted due to the need to observe commercial confidentiality (actually it isn’t, a lot of the time, but that’s another story). The Cameron revolution is under way before a single vote has been cast and it shows every sign so far of being as ideological, divisive and destructive as Thatcher’s. We in Essex and Barnet may be living in Cameron’s sandbox today, but the results of these experiments could inform the local services of everyone tomorrow – for years and year to come.